Today was anything but a normal Easter Sunday. After just a few hours of peaceful slumber I was brought back to consciousness by a puppy that still has not learned that humans need more than 3 hours sleep between potty breaks. After a futile attempt to get back to sleep I was rousted again. This time by excited children who came waving Easter baskets in front of my face. The kids have all recovered from their bout of colds, but Gidget and I are still suffering some of the effects. Gidget is hacking up her left lung, and my throat has the constant feel of gravel in it. Since we were feeling under the weather we figured it would be impolite to “infect” anyone else in the family, and decided we would stay secluded at the house for the duration of this fine day. The kids sat outside bird watching for hours, and I joined them out at their fort a time or two also. They explored our wooded area for the first time in several months and discovered the bird’s nest shown in the photo above. The mama bird sat just above us, and we got lucky. She’s a brown thrasher. 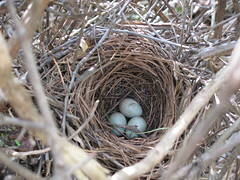 Thrasher’s are known to draw blood on animals and humans who approach their nests. As the afternoon turned into evening, we came inside and made a simple dinner. Chicken for some, burgers for others, but a reasonably good time for all. It’s not what you eat on Easter Sunday, it’s who you spend it with and why. Through all the congestion and in-between the hacking sessions, we had a nice, simple, respectful day at home. Now late on the sabbath day, as it began to dawn toward the first day of the week, came Mary Magdalene and the other Mary to see the sepulchre. And behold, there was a great earthquake; for an angel of the Lord descended from heaven, and came and rolled away the stone, and sat upon it. He is not here; for he is risen, even as he said. Come, see the place where the Lord lay. And go quickly, and tell his disciples, He is risen from the dead; and lo, he goeth before you into Galilee; there shall ye see him: lo, I have told you. Today marks the end of my third month of unemployment. I am hoping to turn things around this week. I hope you had a wonderful Easter weekend.